I'm giving the grid node thing a try on a fresh Azure VM. My tests are running and failing, and the logs show a bunch of errors related to my usage of fat arrows which were introduced in C#6. WARNING - NCrunch: This project has been built with MSBuild v4.0 because MSBuild v14.0 was not found on this server. Some build tasks may fail when not executed using the correct version of MSBuild. 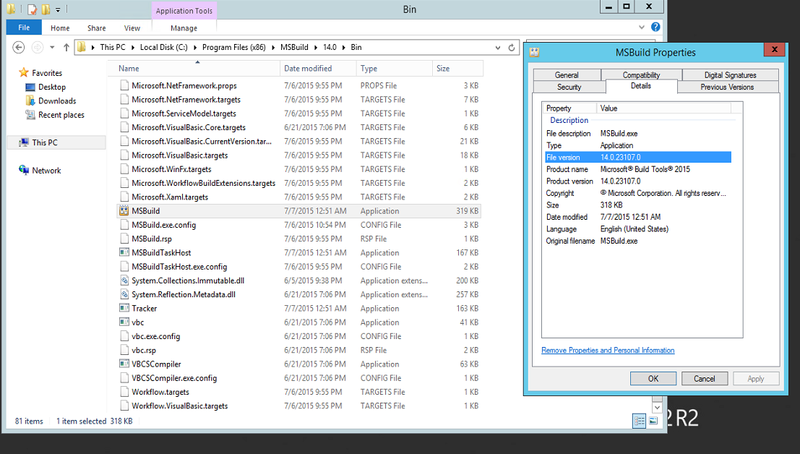 However, I know for sure MSBuild 14 is installed, as I can see it on disk (installed via the VS 2015 Build Tools). Do I need to add something to my PATH, or is the NCrunch grid node just not picking up this installation for reasons outside my control? Hi, thanks for sharing this issue. NCrunch searches for MSBuild through the presence of the "Microsoft.Build, Version=14.0.0.0, Culture=neutral, PublicKeyToken=b03f5f7f11d50a3a, processorArchitecture=MSIL" assembly inside the GAC. If NCrunch can't find this file in the GAC, it won't be able to resolve the build engine and will give you this warning. Check that this assembly is installed in the GAC. C:\Program Files (x86)\Microsoft SDKs\Windows\v10.0A\bin\NETFX 4.6 Tools>gacutil /i "C:\Program Files (x86)\MSBuild\14.0\Bin\Microsoft.Build.dll"
via command prompt and I have progressed a little further. 1 user thanked jschreuder for this useful post. I have similar problem but with Visual Studio 2017. When I had Visual Studio 2013 both on my local machine and on remote server, everything works as expected. Now, I'm using Visual Studio 2017 on my local computer, and Build Tools for Visual Studio 2017 on remote server. This configuration works as expected - I have TeamCity on my remote server building my project using Build Tools without problem. ..\..\..\windows\Microsoft.NET\Framework\v4.0.30319\Microsoft.Common.targets (917, 7): The target "AssignLinkMetadata" does not exist in the project. WARNING - NCrunch: This project has been built with MSBuild v4.0 because MSBuild v15.0 was not found on this server. Some build tasks may fail when not executed using the correct version of MSBuild. Often this can be caused by configuration differences between your client machine and the grid node, in which case the installed SDK directories may be different between machines. If you are experiencing consistent problems when building this project on the grid node, the missing files listed above are worth investigating as they may highlight SDKs required on the grid node that have not yet been installed. Please note that this is not necessarily an error case as projects very often build successfully on grid nodes with only a subset of the client machine's installed SDKs. C:\Program Files (x86)\Microsoft SDKs\Windows\v10.0A\bin\NETFX 4.7.1 Tools>gacutil.exe /i "C:\Program Files (x86)\Microsoft Visual Studio\2017\BuildTools\MSBuild\15.0\Bin\Microsoft.Build.dll"
Any ideas how can I solve this problem? This problem is caused by the inability of NCrunch on your grid node to locate the installation of VS2017. VS2017 is much more complicated to reference than other versions of VS, as there is no reliable central way of finding it outside of a COM API, which I've had some problems with in the past. I am uncertain of how this COM API operates without a physical installation of VS on the machine. I'm not sure how Build Tools for Visual Studio 2017 qualifies - this use case has not been tested and I cannot guarantee that it will work. It's quite possible that you may need to physically install VS on the grid node itself. "C:\Program Files (x86)\Microsoft Visual Studio\2017\Enterprise\MSBuild\15.0\Bin", then you should set this environment variable to "C:\Program Files (x86)\Microsoft Visual Studio\2017\Enterprise"
Make sure the environment variable is defined at system level and that the grid node service is restarted after it's declared. If in doubt, reboot the machine. 1 user thanked Remco for this useful post. NCrunch was unable to parse this project file because of an unexpected error: Microsoft.Build.Exceptions.InvalidProjectFileException: The tools version "15.0" is unrecognized. Available tools versions are "2.0", "3.5", "4.0". But in my case VSINSTALLDIR is C:\Program Files (x86)\Microsoft Visual Studio\2017\BuildTools. VisualStudioVersion is unchanged = 15.0. But is working without problem. Thanks for help. Great to hear, thanks for confirming! Don't worry about the missing file warning. This is just a goto-hint if you do actually have any problems. Those files naturally won't be on the grid node because it doesn't have VS installed. This page was generated in 0.075 seconds.